Just weeks before Jon Lord's passing in 2012, he finished work on what he took pride in being his ultimate achievement in the studio. That was a reworking of his Concerto which was only recorded live prior to that on two occasions. The first time was in 1969, and the second almost thirty years to the day in 1999. There are some differences he made to the score, but he assured fans that they were improvements on what was essentially a hasty project to begin with. For the band instead of Deep Purple on this project he selected not only some of the best around, but great friends of his, as well. This included the likes of Steve Morse, Bruce Dickinson, Steve Balsamo, Brett Morgan, Darin Vasiley and Guy Pratt, not to mention several more. 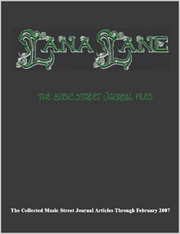 The Mediabook Edition comes complete with a bonus DVD and very nice seventy-two page booklet. This has always been considered a progressive rock merging of sorts. I don't think there is a fan of his on the planet who wouldn't find this to be a personal “must buy.” For this fan, going back a long way with the score can have an impact on how to review it, so it's hard not to compare it to the original performances. That’s especially true because it's a different band and orchestra, the Liverpool Symphony, conducted by Paul Mann, rather than the Royal Philharmonic, conducted by Sir Malcolm Arnold. 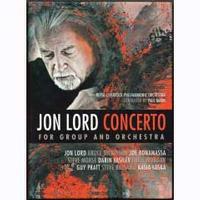 The video portion contains some personal notations from Jon Lord concerning the Concerto '99, as well as personal essays from conductor Paul Mann on the score itself and the sessions. It also has an essay from the translator of the original score, done by Dutchman Marco de Goeij, and lots of photos from the recording session. The Paul Mann interview is lengthy and very descriptive with an intelligent and very delicate approach concerning the composer. It comes highly recommended as the version to reach for because of the insight contained in this section, as well as the accompanying seventy-two page booklet. The idea here was for the group and orchestra to sort of antagonize one another, and it's interesting to hear in the studio. Jon Lord is featured most prominently here, although everyone puts in outstanding performances, especially Steve Morse. I don't find any of this necessarily better or worse than the original performances, but they do tend to shine by the differences. That alone provides a remarkable result in doing this. This being where the vocal section takes place, it's usually respected as the most important movement. And Bruce Dickinson gets to sing Ian Gillan's part which was written on a napkin at the bar just prior to the show in 1969. He does a fine job, as well as the others in the band and orchestra. This compares brilliantly to the original performances. The third movement has always been considered the extravaganza of the event and Jon Lord's big moment in the spotlight, and here it's really no different in the outcome. Not only does the performance deliver a remarkable sense of compatibility to the band, just as with the original, it tends to put the icing on the entire cake. It is the focal piece of the score. This is an absolutely brilliant interpretation of an already brilliant piece of music in improvised fashion.